All year long, astronomers have been writing about Comet ISON: will it sizzle or will it fizzle? I was chomping at the bit, waiting for the visual magnitude to brighten enough to try viewing this comet through my own telescope (shown on the right). Finally, the weekend, a dark sky, comet magnitude and perfect weather all came together Saturday night, October 5th and Sunday morning, October 6th. First, backtrack 16 years. I fondly recall the great comet of 1997 – Comet C/1995 O1, Comet Hale-Bopp, which ruled the skies for 18 months. When it passed perihelion on April 1, 1997, it was brighter than all stars in the sky except for Sirius. With its 50 degree long tails it spanned the evening sky, and was the talk of the town, the water cooler and even led the commute chatter among the passengers in my van pool. Everybody saw it. I sketched it. 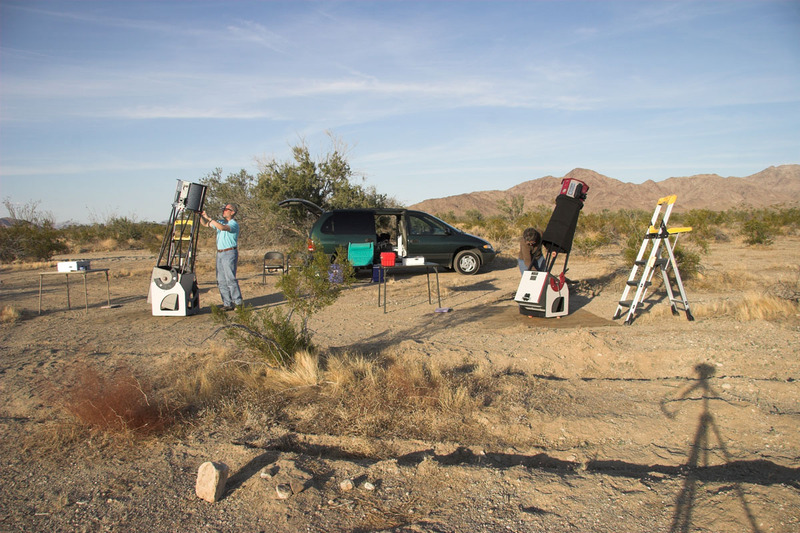 Astronomy clubs flourished with eager new stargazers. Telescopes were literally flying off the shelf. Then, two years after it faded from view, in April 1999, I observed Comet Hale-Bopp from Ayers Rock in the Australian Outback, through my 12.5-inch telescope, as it scooted in front of the Large Magellanic Cloud. It was over 8 AU/700 million miles away, as far away as Saturn is from Earth. I’ve been remembering the anticipation then the excitement of Hale-Bopp while impatiently waiting for ISON. Comet ISON’s magnitude is somewhere in the magnitude 10-11? range at the time of my Sunday morning sketch, tho’ all the sources I use show different magnitudes. On October 5, when I observed and made this little sketch these three sources I regularly use show different magnitudes. Magnitude 10.6 here. Magnitude 10.7 here. And magnitude 10 (or even brighter 9.something) here. So for my observation, I thought it would be more interesting to show the magnitude of many of the the nearby stars I could see in my eyepiece. I used my 12.5-inch f/6.75 reflector and a 19mm Nagler Panoptic eyepiece for a magnification of 96x. Conditions were spectacular, very steady seeing at 5:00 am, and away from the the Zodiacal Light and Milky Way the limiting magnitude had been an impressive 6.5. I was able to see three 14.0 magnitude stars, two very near the comet. I tried higher and lower magnification (over 200x and under 50x) and couldn’t see the comet in any eyepiece over 125x. 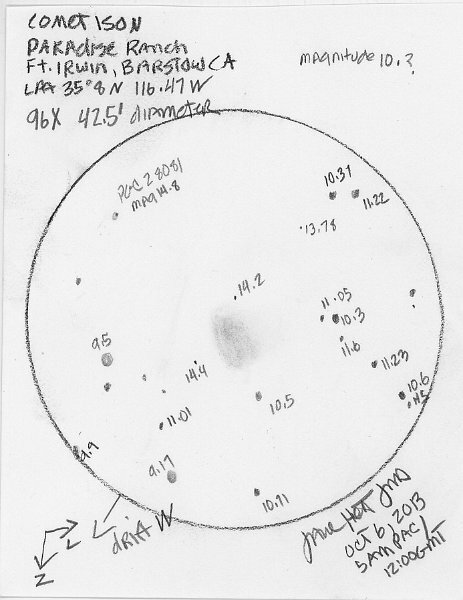 The sketch shows the comet a bit brighter than it really appeared. It was like an oval puff of barely-there cloud with a brighter condensed area, I assume was the coma. It was much larger than I was expecting. No tail visible. Can’t wait to observe and sketch it again on October 26th despite a big bright moon and November 2nd which should be a perfect moonless viewing night. Until then, I’m looking forward to hearing about more visible reports. Photos are great, but star-stuff hitting your eyes is the best! We have just been doing my homework which was about the planet Earth ( My homework was boring) So instead my Dad (Alex) found your stuff on the NASA website. This was FAR more interesting and I loved finding out about what can be seen from Space. I also really liked your guide to the October skies. We live in the UK and the moon looks bit different to the one you showed in California. Then we looked again and it was exactly the same! I was actually born in Brooklyn, NY in 2007!